It is often stated that textual criticism of the Bible ends when the era of printed books begins; from that time on, there is no new evidence available. This is largely true -- but not entirely. It is true enough that the first printed New Testament, Erasmus's edition which eventually led to the Textus Receptus, is derived from manuscripts we know, and thus it has no value. The earliest Latin Bible is almost equally useless; while the source manuscript is not known, the text is late. And yet, there are occasional reasons to care about printed editions, sometimes of the Bible and more often of other ancient writings. Early editions of works such as Josephus or Chaucer frequently take us back to manuscripts we no longer have. Indeed, even the Textus Receptus had value of this sort for a time; 1r, the manuscript used to compile the Apocalypse, was lost for many years. In addition, some of the early critical editions refer to manuscripts which are now lost -- some of them, indeed, quite interesting, such as 1518 (a member of Family 2138, which has probably but not certainly been recovered) or the Latin codex Demidovianus (never recovered). For example, printing -- as in the use of stamps to apply letters -- had been known for at least a thousand years. In fact, the Chinese seem to have mass-produced such stamps -- the first step toward movable type. For many years before the production of printed books, they were stamping sheets of silk with customized symbols -- the logo of the company. And the Phaistos Disk -- widely dated to c. 1700 B.C.E. -- is a clay disk with the symbols stamped in, though there is no evidence that the stamps were mass-produced. Playing cards seem to have been copied repeatedly from woodcut panels by the late fourteenth century (if you think about it, playing cards that are not mass-produced are nearly useless. Hence the fact that gambling in the Middle Ages was based almost entirely on dice). And there are indications that individual documents may have been run through a sort of a hand press using a single hand-carved stamp. Thus all the concepts needed for a printing press were in existence before the actual press came to be. Why, then, did it take so long for printing to be developed? Part of it is the lack of material on which to print. Until paper became widespread, printing was pointless. There are, it is true, a handful of books printed on vellum. But if vellum had been the only writing material, there really would have been no need for a printing industry; the supply was simply not sufficient to allow large press runs, and if one is producing only a dozen or so copies, hand copying is economically competitive (since the effort of setting the plates -- backwards! -- and producing test runs and proofreading and organizing the results is far greater than the effort needed to produce a single manuscript). Paper took a long time to come into its own. Chinese history says that the invention was first licensed by one Tsai Lung in 105 C.E. 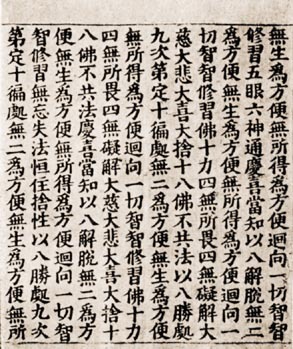 This was, probably, linen paper, still among the best types available because the cellulose fibres are especially long, making for a firmer, longer-lasting material, though the earliest surviving Chinese papers are really too thin and light-weight for printing; they were written on only one side because the ink showed through. It would be hundreds of years before heavier paper became the standard. Even in the fifteenth century, many paper mills supplied inferior grades; the Mainz Vulgate was printed on imported Italian paper rather than local German stocks. Paper is thought to have arrived in Japan around 610, and we are told of a mill at Samarkand in 751, another at Baghdad in 793. The Moors seem to have introduced it to Europe around 1150 at Toledo; Italy's first mill was apparently founded at in Fabriano in 1276. Even then, the paper trade was slow to grow; England, for instance, apparently did not have a a paper mill until around 1493, when John Tate set up the first -- meaning that all of Caxton's early English books were printed either on imported paper or perhaps vellum (but no vellum copies survive). Indeed, it was not until after the invention of printing that paper became fully respectable -- though, contrary to some reports, early paper was quite long-lasting and durable. But it hadn't the reputation of vellum. Printing changed that; paper proved a better surface for press work, because the ink soaked in rather than just staying flat on the surface, making the books printed on paper much more resistant to damp and wear. We observe also that mass-produced documents came into being well before what we usually call "printing." To restate some of what was said above, it is believed the Chinese were printing books from hand-carved wooden originals by the ninth century. They were not printed on presses; the forme was inked and paper placed on it and rubbed. This was not an easy form of printing, since a single accident in carving the woodblock could destroy the whole work. Still, large numbers of copies could be made by this means (though printed on only one side). Movable type formally goes back to ancient China also, where pottery letter stamps were produced. This technology, however, never went anywhere; Chinese ideograms were just too complicated. And while it's easy to produce large stamps out of ceramic, it's by no means easy to make the small blocks required for movable type out of clay. Still, the Koreans seem to have managed almost all the tricks needed for modern printing by the fifteenth century: They had presses, ink, paper, even interchangeable letters. But the complexity of the ideographic languages of the east defeated them: There were simply too many letterforms to cut and mold, and too few symbols were re-used. So Europe had to re-invent the technology. By the fifteenth century in Europe, some quite large "block books" books were being produced with hand-carved wooden plates; the Historia Sancti Johannis Evangelisque ejusque Visiones Apocalypticae appeared in several editions, of 48 or 50 pages. These usually cannot be dated precisely; few early woodblock prints contained much text, because of the difficulty of cutting the fine lines involved (see the example at right, from a book about the torments a dying sinner could face; note both the lack of uniformity of the lettering and its ragged appearance); the few surviving specimens with text all appear to be be more recent than the earliest printed specimens. Still, there is a single-sheet woodblock print from 1423. Book-making also required a different sort of ink. Ordinary inks were just too volatile -- and too runny; they would soak through paper pages. Printer's ink was a development from oil paint, invented earlier in the fifteenth century by Jan van Eyck. Early oil paints consisted of oil (usually linseed or walnut oil), amber resin, turpentine, and mastic; printers apparently added soot (ideally, lampblack, though wood soot was often used because it was easier to get) to this varnish to produce a black ink. It is possible (though this cannot be proved) that this was adapted for printing by one Laurens Janszoon Coster (or Koster), or perhaps some other printer (several firms seem to have been seeking ways to mass-produce books in the mid-fifteenth century). Coster may also be responsible for the printing press as such; some believe that he was actually producing books on a press by around 1450, though probably with wooden type, at least initially; only fragments of these publications survive, and the date is uncertain. The arguments on behalf of Coster continue, but he seems to have fewer proponents now than a century ago. Colour inks also came into use early -- indeed, there is some red print in the Mainz Vulgate (pages 1, 7, 9, 257, and 258, the last two regarded as printed on two different presses), though most of the colour work was hand done. (It appears that the effort of creating two-colour was simply too great; after trying two-color printing on pages 1, 7, and 9, the process was abandoned in favour of hand rubrication, and the second attempt, on pages 257-258, also was given up.) The red of the Mainz edition came from cinnabar (mercury sulfate); early blue inks used ultramarine (lapis lazuli) or smalt (a cobalt compound). Metallurgy also offered a crucial advance as it finally produced a material suitable for the casting of type, which must be hard enough to be usable but melt at a low enough temperature to be convenient and not change size too dramatically as the temperature changed (the final compound included lead, tin, and antimony -- the latter an element unknown to the ancients, and also highly poisonous. The best mix was about 65% lead, 25% antimony for hardness, and about 10% tin for flow and ease of melting, though the price of tin caused many type foundaries to reduce the proportion, producing significantly cheaper but more ragged-looking type). The press as such was not new, and indeed had been involved in paper-making since at least the fourteenth century: Presses were used to squeeze the water from the sheets as they came from the vat. Similar devises had been used to squeeze seeds for oil for centuries before that. The trick came in finding a way to assure that the forme was applied to the paper in exactly the right place and absolutely flat; a major failure in either department would ruin the page, and even a minor failure would result in blurred type or a crooked-looking page. Unfortunately, because information from the period is so lacking, we do not know with certainty how this advance was achieved -- but obviously they managed somehow. It is theorized that the presses had a series of pins which fit through holes in the paper; this method, at least, was used in later books, and such holes are found in early printed volumes. Indeed, they are more obvious in those early books, which may have as many as ten holes per sheet, and those holes located sometimes in highly obvious places; by the early seventeenth century and the time of the King James Bible, the number of holes was down to two, and they were placed in such a way that they disappeared into the binding of the book. All these factors finally came together to produce the so-called "Gutenberg Bible" (named after Johannes Gensfleisch zum Gutenberg, c. 1399-1468), which I will hereafter usually refer to as the "Mainz Vulgate" to avoid prejudging questions about its source. Our knowledge of this work is at once extensive and incomplete. We do not even know with certainty that Gutenberg was involved; there is clear evidence that he was engaged in printing (in 1458, France's King Charles VII instructed Nicolaus Jenson to study Gutenberg's art) -- but no real data to show that he was involved in the printing of that first Bible. The volume itself is little help; it does not give the sort of copyright information we would expect today, and doesn't have a colphon, let alone a title page; the printers were still thinking in manuscript terms. The only prologues are to the Bible and the books, not to the edition. It is generally agreed that the Gutenberg Bible was printed in Mainz, but the date is unknown. The only absolute evidence we have is that, first, one of the surviving copies contains a comment written August 24, 1456 by rubricator Heinrich Cremer of the collegiate church of Saint Stephen at Mainz, and second, that in March 1455 Enea Silvio Piccolimini, then Bishop of Sienna and later Pope Pius II, described a Bible featuring a new "way of writing" -- presumably printing. The printing must therefore have been done by 1456, and at least underway by 1455, but we do not know how much before; most estimates for completion of the work range from 1450 to 1456 (though Matthias Palmer in 1483 published a chronicle stating that Gutenberg invented printing in 1440 -- this based perhaps on another technology involving presses that he was fiddling with at the time. 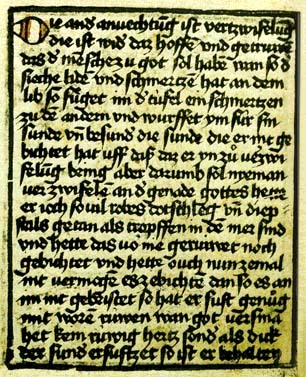 The 1450 date may be attributed to Johann Koelhoff the Younger's 1499 Chronicle of Cologne, which tells us much about printing but which was banned and caused the author to be exiled in 1502; the date is supported by a statement by Johann Schoffer, the son of Gutenberg's collaborator Peter Schoffer -- hardly the most unbiased source. But, in 1505, in a German edition of Livy, he credited the invention of printing to Gutenberg in 1450, and credited Schoffer the Elder and Johann Fust -- of whom more below -- with improving it. To be fair to the Schoffer dynasty, they weren't in it entirely for the glory or money; Schoffer would in time be one of the first printers of Tyndale's New Testament -- a task which, at the time, promised neither profit nor safety). In the early twentieth century, most scholars favored the end of that range of dates; in recent years, however, discovery of earlier printed sheets has inclined many scholars toward an earlier date. The flip side of that is, in 1455, Gutenberg's financier Fust sued for repayment of loans. That would seem to imply that sales of the work were slower than expected, or that printing took longer. A late date still seems reasonable to me. And the aftermath of the lawsuit was, in any case, strange: Although Fust won the suit, and apparently took possession of most of Gutenberg's printing equipment, the single most important element -- the type used to print the Mainz Vulgate -- does not seem to have passed into his possession. We do not see it again until about the 1480s. We can say definitely that broadsheets were emerging from the press by 1454 (a printed indulgence from that year still exists), and works such as the "27-line Donatus" are sometimes tentatively dated as early as 1449 -- but we don't know if that preceded or followed the production of the Mainz Vulgate; indeed, we can't prove that they came from Gutenberg's press; they use a different typeface, and this face appears to have been used both before and after the Mainz Vulgate. It seems likely that Gutenberg and company first printed smaller works, but it cannot be proved. It is also possible that both projects were going on at the same time: Gutenberg may have printed some smaller items to raise money while still working on the big project. The earliest printed document with an absolutely fixed date: The first paragraph of the Cypriot Letter of Indulgence (31-line version), from 1454. Note the distinct difference in typeface from the Mainz Vulgate. In any case, those practice attempts were really just that: Practice. The history of printing really begins with that first true book, variously known as the Gutenberg Bible after its seeming printer, the Mainz Bible after its place of origin, the 42 Line Bible after the number of lines of text on the typical page, and the Mazarin Bible after the library holding the first copy to really gain attention. Comparison of the two earliest known typefaces. Top: The Donatus-Calendar face, in use by 1454, a "Bastarda" type. Bottom: The type of the Mainz Bible, a "Textura" font. The magnitude of the Mainz Vulgate project, given how little is known to have gone before, is astonishing. The final product, printed as it was in large type (the price Gutenberg paid for using Blackletter fonts) was 1,282 pages long, on pages measuring roughly 40 cm. by 30 cm. (They appear to have been conformed with the "golden ratio" that mathematicians call f.) With 42 lines per page, and two columns, and about 30 letters per line, that's about 2400 different items of type per page (and each page, of course, is only part of a sheet); in all, the Mainz workshop probably had to cast tens of thousands of individual letters to complete the work (it's been estimated that they would have needed three million letters, and thirteen tons of type, to print it all at once). Although it appears that only one or two presses were used when the process began, it is believed that six were in action by then end (though some would dispute this). It is believed that four compositors were employed at the beginning, with the total eventually rising to six. (Of course, this too is disputed, but it must be admitted that there are differences in the styles of contraction, etc. in different parts of the book.) Given the complex way by which type molds were created in the early days of printing (a punch, or "patrix," had to be carved in steel, which then was punched into softer metal to produce a "matrix" around which a wooden frame was built and into which the molten metal was pouted to make the type), it is estimated that it must have taken about half a year just to create the typeface, many months more to cast the type from it, and roughly two years to see it all through the press. It appears, from the watermarks, that paper from four different mills, or at least four different batches, was used. Even more amazing is how well the type is handled. The major surviving printed work thought to predate the Mainz Vulgate is the Donatus, which is rather poor typographically: Letter spacing is inferior and the letters themselves were of uneven heights, producing badly-inked pages. All these problems were corrected for the Mainz Vulgate. The type is not actually very legible (it's just too tall and thin and spiky), but it certainly presents a beautiful page. Not all copies of the Mainz Vulgate, however, are identical. Although it is said to have had 42 lines per page, the early pages (such as that of Genesis shown below) had only 40 lines (pages 1-9, plus 257-263). The count was later increased to 41 lines, then 42. What's more, it's clear that the size of the press run changed as the printing progressed. (It's been theorized that the printers sold subscriptions to the book, and eventually ended up with more subscriptions than they had anticipated, forcing them to produce more copies, but, again, we can't prove it.) Since more copies were desired than had initially been planned, there were not enough prints of the early sheets. Type at this time being naturally in limited supply, the formes used for the printing of those sheets had been disassembled, meaning that these pages had to be reset. Thus, although all the final pages are identical in all copies of the Mainz Bible, there are, in effect, two "editions" of pages 1-63 and 257-316 of the first volume, and also of pages 1-31 and 323 of second volume (one suspects the revised p. 323 is a result of an error; once it was spotted, the page was modified but the old pages used. As we shall see, this was typical of early printing). Even if we ignore the changes in the text, no two copies of the Gutenberg edition are identically finished. At this time, books were sold in a sort of unfinished state, without a binding and without interior illumination. The three photographs below illustrate this point. The King's copy was beautifully illuminated with many colours of ink. The Grenville copy has some illumination, but much more limited; it also lacks section heads, making it much harder to actually find passages. Other copies are almost startlingly plain. Three copies of the beginning of Genesis in the Gutenberg Bible. Note the different illuminations, which were individually added to the printed pages. Left: The Grenville copy (British Museum). Center: The King's Copy (British Museum). Right: Unknown copy (from a black and white photograph; the initial "I" is in multiple colours, and some of the text may be as well). Observe that the heading "Genesis" was added by hand in two of the three copies, and that each book has different lettering colours, etc. It has been stated (I do not know on what basis; I have a feeling that it was calculated by dividing the estimated number of copies by the amount Fust lent Gutenberg) -- that the Mainz Vulgate sold for 30 florins. A very high price, certainly, equal to several years' wages for a crafstman. But hardly exorbitant when compared against the price of a manuscript copy of a full Bible, and the rate of errors was presumably lower. Textually, the Gutenberg Bible is said to have a text close to the Paris recension of the Vulgate. It is reported to be a good representative of that type -- but that was still a late recension (thirteenth century). Incidentally, it was many years before books truly became standardized in the sense that all copies were identical. In 1572, John Day printed Matthew Parker's De Antiquitate Britannicae Ecclesiae, of which 25 copies are said to survive, no two of them the same. And the copies of the famous First Folio of Shakespeare are also all different, as various errors were corrected throughout the press run but the old sheets retained and used. This is parallel to the case of page II.323 of the Mainz Vulgate. If the history of that first full-fledged printed book is obscure, the aftermath is known. It appears that Gutenberg, if he did produce that first Bible, was financed by one Johann Fust and assisted by Peter Schoeffer. Fust, unhappy with Gutenberg's practices, apparently eventually called in his loans, took over Gutenberg's machinery, and went into business for himself, retaining Schoeffer (his future son-in-law) to handle the technical details. The result of this was the so-called "Mainz Psalter," with a colophon mentioning the two printers and a date of 1457. This volume was noteworthy, among other things, for its use of printed decorative initials in multiple colours -- a process still not entirely understood, but highly impressive: Black and red on every page, with musical notation, and red and blue initial letters. By 1460, we see our first book with full bibliographic data, an edition of Balbus's Catholicon, which has a colophon stating that it was printed in Mainz in that year ("annis Mccc lx") "without... reed, stylus, or pen." Unfortunately for the people of Mainz, but fortunately for the rest of the world, that city had been in the grip of civic conflict for many years due to poor management and bad fiscal practices (indeed, Gutenberg seems to have fled for a time, returning some time between 1444 and 1448). And though there was calm at the time Gutenberg began his work, the city was gripped by civic conflict in the late 1450s and early 1460s as two rivals strove to gain the archbishopric. It appears that this conflict caused several printers to flee from the city, helping to spread the new technology. The spread of printing thereafter was quite rapid. By 1460, an exile from Mainz (possibly Gutenberg himself, after the city was sacked and many residents driven into exile) had started a printing house in Bamberg and produced what is known as the 36-line Bible. Strasbourg also seems to have housed a printer, Johann Mentelin (possibly an associate of Gutenberg in his wanderings -- Gutenberg, if we can follow his many aliases, lived in Strasbourg before 1444), who produced his own Bible by 1460 and who also earns credit for the first vernacular printed Bible (a German edition regarded as a very poor translation, full of silly errors, but it was still in German rather than Latin). Augsburg saw books produced by Gunther Zainer probably from 1468. Anton Koberger was printing books at Nuremberg around 1470. Arnold Ther Hoernen and Ulrich Zell were in business in Cologne by about that time. Charles VII of France tried to set up a press operated by Nicolas Jenson; the attempt failed and Jenson went to Venice, but France managed to attract a group of German printers in 1470. There were already presses in Rome and Venice and other parts of what is now Italy. It is not really possible to establish when printing came to the Netherlands, because of the work of Coster, but it was certainly by 1473. The Spanish had their first printing houses soon thereafter. In 1476, Ulrich Han published the Missale Romanum, richly endowed with music notation. And, some time before 1475, William Caxton (in order to meet the demand for his translation of Raoul Le Fèvre's history of Troy), opened the first English printing shop. Caxton was a very conservative printer, usually technologically behind the times, as was his successor Wynkyn de Worde, but they did make at least one advance: They published books, usually in the vernacular, for popular rather than scholarly consumption. The latter market was quickly overcrowded; it has been estimated that the number of printers more than quintupled from 1470 to 1480 (from about 16 to 85 or so), causing saturation of the market for scholarly books and a collapse in the price. There had been vernacular works before Caxton (in fact, we have a fragment of a Sybilline Prophecy in German in the Donatus-Calendar type, so Gutenberg may have been printing in German even before the Mainz Vulgate), but these had all been incidental. The Excesses of Early Printing: The first nine words of Acts 1.1 as it appears in the Gutenberg Bible and as we would write it today. Note the suspended "m" at the end of "primum" and "quidem," the single ligature for "de," the suspended "n" in "omnibus," and the abbreviation used for "quae." To set this line using a true alphabet requires 18 symbols. Gutenberg, even if we ignore the initial fancy letterforms, required 23 different symbols. (It is calculated that the Mainz Vulgate used 290 different letterforms -- some of them simply different widths of the same letter to allow lines to be fully justified. The complete set included 47 capital letters, 63 minuscules, 92 abbreviations, 83 ligatures, and five punctuation marks.) Early Greek printing used even larger character sets. Jenson also seems to have been responsible for the first font of Greek type, which he used in 1471 for works of Cicero. (Until that time, printers had simply left space for Greek words if they needed them at all.) Sadly, his example in this regard was not followed; the next great printer of Greek works, Aldus Manutius of Venice, used typefaces similar to hand-written Greek, meaning that he needed over 500 separate symbols. The Complutensian Polyglot was one of the few early works to use a Jenson-like alphabet rather than imitate the Aldine press in all its needless complexity. Still, Manutius deserves great credit for establishing standards for the printing of Greek -- as well as other languages. From 1494, he printed works of Aristotle, Vergil, Dante -- and, of course, the LXX. The Aldine press was noteworthy not just for its innovations but its scholarship -- establishing, arguably for the first time, the standards which we now consider necessary for a published work. A printed book, after all, exists in many copies; it should be prepared with extra attention compared with a single manuscript copy -- and it is also much harder to set, since hand-set type must be placed in the forme backward. Printing of course established other standards -- e.g. distinguishing the letters i and j, as well as u and v. S. H. Steinberg's Five Hundred Years of Printing (revised edition by John Trevitt, p. 31) attributes this to poet Giangiorio Trissino and credits the printer Ludovico degli Arrighi with perpetuating it. The most important city for our purposes, though, is Basel, where Berthold Ruppel was in business by 1468. Also working at Basel was Johann Amerbach, who seems to have gone into business around 1478. And one of his pupils was Johann Froben. Froben has a bad reputation in New Testament circles because he hurried the Textus Receptus through the press. This is rather unfair; it's true that Froben produced a hurried edition, but he also produced an affordable edition (which hardly describes the competing effort of Cardinal Ximenes), and he did call upon Erasmus -- who was, after all, the leading scholar of the time -- to produce it. If Froben had not imitated the Aldine typography in all its intricacies, that first Greek Bible might not have been so badly printed (and while the text would have been bad, would a Complutensian standard for the New Testament really have been any better?). Froben also deserves some credit for producing an inexpensive octavo edition of the Vulgate in 1491; it has been called the "poor man's Bible." He also worked hard to produce a critical Vulgate; it is said that his is the only early edition to have the original readings at many points. If others made ill use of his New Testament, he nonetheless deserves credit for trying to produce good and valuable materials. We should perhaps note that many of the tools used in textual criticism of manuscripts also apply to textual criticism of books. Not all ancient books survive intact; indeed, most of the earliest ones suffered enough wear and tear that they were good for nothing but to be used in the bindings of other books. So what survives is a page here and a page there, with no date even if the book originally had a dated title page (and, as noted above, not all did -- nor were they reliable when they did). And the value of a book can vary with its date; if an edition of some work can be dated to the beginning of the printing era, then it surely comes from a manuscript source, and that manuscript might have been good. The close links all these books have with biblical scholarship is shown by the title given to them: Books printed before 1500 are known as incunabula, a word connected with the cloths used to wrap Jesus in his infancy (though the Vulgate of Luke 2:12 does not in fact use incunabula). We should note that the singular incunabulum found in some references is a false singular. An interesting problem with early books is the lack of copyright. Manuscripts of course were never copyrighted, so the need for protection for printers (let alone payment of royalties) was not at first realized. The effect of this was that any publication could be pirated -- as, e.g., the 1518 Aldine edition of the Greek Bible is essentially a copy of Erasmus's New Testament, right down to the more blatant typographical errors. Nor was that the worst case of bad copying known. In the case of Shakespeare's "Titus Andronicus," the so-called "second quarto" (Q2) was set from an earlier edition, Q1, which had several defective pages -- and the editors, rather than find another copy of Q1, just made up their own version of the text. (They couldn't go back to the original plates, of course; as with all books at that time, the plates had been disassembled so the type could be reused.) And if authors were paid for their work at all, it was in the form of what we would now call an advance, such as Erasmus received from Froben. Unfortunately, if the Stationer's Company provided copyright (which tended to suppress corrupt editions, despite its other faults), and if it served as a sort of guild for printers, it also had the right to censor works. (Something much easier to enforce in England, where all the printers seemed to settle in London and Westminster, than in Germany or even France.) Much that might be useful to us now was no doubt stranded in manuscript form. Though this was nothing compared to the censorship applied in other countries later (as, e.g., in Austria-Hungary in the nineteenth century). By this time, of course, we are past the era when most classical works were first printed, so the later history of copyright isn't of much interest directly. But we might as well sketch a little of it. It was in 1709 that copyright finally started to apply to authors. Copyright by that time was granted to the printer for fourteen years, but at the end of that time, ownership reverted to the author, who was permitted to re-sell his work as he chose. This also prevented any attempts at permanent copyright -- an unmitigated evil in scholarly fields which has effectively come back under current law (current copyright typically lasts about a century), but without the compulsory licensing provisions of the seventeenth century law: Back then, copyright applied only to people who kept books in print. To sum up our history, it is often stated that the arrival of printing spelled the end of the need for textual criticism. This is largely (though not entirely) true. But this hardly makes the invention of printing a problem for textual critics; in truth, it is only the inventing of printing that makes the discipline possible -- for it is only now that all scholars can have access to transcripts of the most important manuscripts, and only now that they can publish the reports describing their methods so that all can adopt or reject them. It has been said, truly, that printing made modern science possible. Textual criticism isn't really a science. But it benefitted just as much. Textual criticism of printed works. It's worth noting that printed books will contain different sorts of errors than manuscripts. A manuscript will contain errors of sight and of memory (or of hearing, if taken from dictation). These errors can, of course, occur in printed works, since they derive from manuscripts. But one sees whole new classes of mechanical errors. For example, type was composed backward on a typesetting stick. So it is perfectly reasonable to see letters set backward. Again, type was taken from a type tray, not hand-written. The compositor might pull out the wrong letter -- or, perhaps, the person who filed the type might have placed a letter in the wrong bin. So one will occasionally see random substitution of letters -- an unusual outcome in dealing with manuscripts. One also gets peculiar errors of the press -- as, e.g., when something falls on the press and prevents the paper from taking an impression (this frequently affects only a few copies of the book, but if only one copy survives, that's no consolation). Another interesting problem is that of changes in an edition. We mentioned above that corrections were made over the course of the press run. In the case of a printed text, the revised version was almost certainly more correct than the first impression, since the source material was still at hand for consultation -- and while that source material might be very bad, a transcription with errors could only be worse. But the trick then becomes to determine which impression is the older and which is newer. Theoretically, if all copies of a book were bound in order (that is, if the first impression of sheet one were bound with the first impression of sheet two, etc. ), this would be easy enough; one simply lines up all the changes and sees the order in which they occurred. But it doesn't work that way; often an early state of one quire will be bound with a late state of another. Determining the order of correction can be quite challenging in that case; I know of no absolutely assured mechanical way of reaching a conclusion (though it is often possible in practice because some of the changes will be simple corrections of obvious errors of the press, which can then be used to indicate the order of more significant changes). One important thing to remember is the possibility of printed forgeries. This is rare now, particularly for modern books, because one generally wants the latest possible date for copyright reasons. It wasn't so in the past; just as a manuscript such as 1505 might have a fake colophon, it was not unusual for books to claim an earlier date. The second quarto of Shakespeare's The Merchant of Venice, printed in 1619, claims to have been printed in 1600 (the actual date of the first quarto; the publishers, I suppose, might have claimed to be duplicating their source, since they copied the first quarto, but it seems more likely that they were trying to make their book seem more valuable -- or even, it has been suggested, working to avoid a copyright lawsuit). An even more amusing instance occurs in the case of the book that eventually became Elizabeth Browning's Sonnets from the Portugese. In the mid-nineteenth century, there was a tendency for authors to produce small private runs of their writings. So when a print dated 1847 of the book showed up titled "Sonnets by E. B. B.," it produced a real excitement among rare book collectors. There was only one problem: Although one authority (Gosse 1894) dated the poems to 1847, more numerous and authoritative sources show that Browning did not reveal the poems to her husband until 1849 -- so there could be no 1847 edition. The "Sonnets by E.B.B." edition was a modern fake, based on Gosse's date. In the process of collating, Hinman discovered the Merchant of Venice forgery. This story is worth telling even though it isn't properly a textual problem simply because it shows us some potentially useful techniques. The quarto editions of Shakespeare's plays were sold unbound -- they were small enough that the usual practice would be for the buyer to purchase several such small books and bind them together. Thus most of the surviving quartos were bound up with other books, not necessarily by Shakespeare. And yet, several volumes were known with the same nine Shakespeare quartos, with widely divergent dates: The Merchant of Venice, A Midsummer Night's Dream, and the inauthentic Sir John Oldcastle dated 1600, King Lear and Henry V dated 1608, and Pericles, The Merry Wives of Windsor, and the inauthentic A Yorkshire Tragedy dated 1619, plus the undated The Whole Contention (a bad conflation of Henry VI II and Henry VI III). The logical conclusion was that these nine plays were being sold at the same time -- hardly possibly if they were printed over a span of 19 years. William J. Neidig then set to looking at the nine quartos. Among other things, he superimposed the title page of Pericles (which admitted being printed in 1619) with that of The Merchant of Venice (which claimed a date of 1600). The two layouts matched. The titles were different, of course, but the bottom part of the plates were identical except for the dates. This included even such details as the nicks in the type. There was no question: The title pages of Pericles and The Merchant of Venice were printed at the same time. In 1619, obviously. The dating on the Merchant of Venice quarto is false. The following list (which is very far from complete; if you know of other books meeting this description, please let me know!) describes some of the various ancient documents for which printed editions are essential tools of textual criticism. Josephus, Against Apion. All surviving manuscripts are derived from Codex Laurentianus of the eleventh century; the only other sources are the (poor) Latin translation and the extracts in Eusebius. The first edition (Basel, 1544) seems to have been checked against a now-lost manuscript. Josephus, Antiquities. As with the Against Apion, the Basel edition seems to have used a lost manuscript. The manuscript tradition for the Antiquities is much richer, so the Basel edition is of somewhat less importance, but it still has hints of a lost source. Asser, Life of Alfred. Only one copy survived to the era of printing: Cotton MS. Otho A.xii. This manuscript was almost completely destroyed in the library fire of October 23, 1731; no part of Asser's work survived. Various transcripts were made, but most are based on the printed editions: Matthew Parker's of 1574, Camden's of 1602, and Wise's of 1722. All of these are rather unreliable (Parker's was interpolated, and Wise had to work from a transcript he himself did not make), but with no other sources, they are obviously essential. Anonymous, The Battle of Malden. From the same Cotton MS. Otho A.xii as Asser (see supra), and equally lost. It was printed by Hearne from a transcription by Elphinston. (Various short works) Caxton (c. 1478), Julian Notary (c. 1500), Thynne (1532), Stowe (1561), Speght (1602), etc.